The crank/bearings currently attach using a "clip" method. It has been noted that there could be a weakness in this particular area of the design. Lets discuss options. I do feel a little apprehensive talking design changes without a actual working Shellmo to judge, but as I am modifying parts to print on the replicator 2 around .2mm resolution it would be nice to work in any easy fixes now. 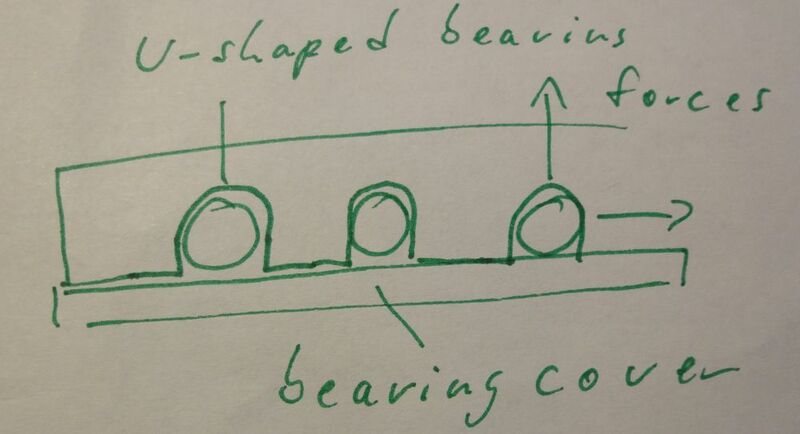 I am attaching a picture of a bearing cover that I designed today. Rainer suggested this concept. He also suggest enclosing the entire top, right now I am going to leave it open because I like to look at the insides. At some point closing it makes a lot of sense to me. This last picture is from Sho (originally posted on the fb group page) showing prototype v3 of Shellmo with a "under support." forward forces generated by the worm gear. A slit in the middle could be opened by the gear forces. Or at least you will have some extra wear at the slit. I agree with you to have an open cover for trials. Give it some cross beams and ears for M3 screws also in the middle section. Yeah, I think this is where I don't have the skills required to do the mechanical design portion of these modifications. Your explanations make perfect sense now that you mention them. I will have to think on it, right now the most noticeable problem is needing the cross members and its evident now that I have printed the test cover, that it needs tied down like you mentioned in the middle with screws, but placement is going to be an issue.